Look out ahead! Leesburg Bikefest 2019 is knuckling down on the throttle and barreling toward us with a jam-packed lineup of high-octane entertainment, including three days of motorcycles, live music, and much more! Whether you’re a diehard rider, a weekend warrior, or just an admirer of motorcycle culture, this year’s event promises good times for all. So mark your calendars for April 26-28 in Leesburg, Florida. And stay connected with the motorcycle attorneys with 911 Biker Law for more updates and event tips! Check out the reasons that we’re most excited for Leesburg Bikefest, including our top-five things to see or do! Motorcycle riding is about more than traveling from location A to location B; it’s a loud, proud, and unapologetic exhibition of love for freedom, camaraderie, and adventure. In 2019, motorcycles are ingrained in the fabric of America more than ever before, as is evidenced by the stars and stripes painted across custom chopper gas tanks, or the national and military flags that wave stoically in the 60-mph breezes behind leather-vested vets, whose motorcycle clubs rumble down our city streets and county roads every weekend. But if riding fuels motorcycle fanaticism, then events like Leesburg Bikefest 2019 are the V-twin engines that convert that personalized freedom into a powerful symbol of unity. Nowhere else in America but at a motorcycle event can lawyers, mechanics, and anybody else come together without so much as a hint of difference between them. Because at the end of the day, it’s all about the bikes. Florida is home to more than half a million registered motorcycles, the second most of any state. Winding roads, diverse scenery, and perpetual sunshine make our state like a mecca of motorcycle riding and, of course, events. And one the largest biker meetups is Leesburg Bikefest, the self-proclaimed “World’s Largest 3 Day Motorcycle & Music Event.” That’s a bold claim, surely. But whether or not it’s 100-percent true really doesn’t make a difference. Because with 30 blocks of concerts, stunt shows, and custom bikes, not to mention 200-plus vendors hawking everything you could ever want to eat, drink, or gawk at, attendees will be too preoccupied — and maybe tipsy — to do the math. On that note, the motorcycle attorneys with 911 Biker Law want everyone who attends Leesburg Bikefest 2019 to have fun, but most importantly, to do so safely. As accident attorneys in Orlando, our day job is to help riders injured in accidents to get fair settlements and insurance payouts. But we also help people to avoid potential riding dangers by encouraging safe habits, such as getting routine tune-ups and never riding while intoxicated. But on top of representing riders in court or before their insurance companies, we’re also bikers ourselves. That’s why we’re promoting Leesburg Bikefest 2019. When Leesburg Bikefest was first held in 1997, it drew a modest crowd of about 5,000. Last year’s event drew more than 300,000, and this upcoming installment seems like it’ll be even larger. Whether you’ve attended Leesburg Bikefest before, or this will be your first visit, here are five ways to jumpstart your experience. Bike festivals range from one day to several weeks in length. Leesburg Bikefest falls right in the middle at three days. For us, that’s the perfect length of time to get our fill of motorcycle excitement. Because no two days are the same — each has different music, events, and casts of characters — we recommend attending the whole event. Of course, if you can only make it for one day, we advise coming on Saturday. It’s usually the busiest, loudest, and most crowded day, but that’s why it’s the best. With at least 55 concerts on the roster, Leesburg Bikefest provides an endless backdrop of music to enjoy. To capitalize on all the musical entertainment, keep a copy of the concert lineup saved in your phone or printed out and folded in your pocket. That way you can attend the performances you’re most excited about, from Vanilla Ice, who flows like a harpoon daily and nightly, to Vince Neil, whose on-stage antics put the “motley” in Mötley Crüe. At bike festivals, having fun is generally the easy part; the hard part is parking close enough to the event that you’re not too tired when you arrive. During Leesburg Bikefest, Main Street in downtown Leesburg is closed except to motorcycle parking. On-street space is limited, so arrive early — festivities begin at 9 a.m. every day. Parking downtown puts you at the center of the action, lets you show off your bike, and allows you to check out others’ machines! The endless rows of bikes on Main Street are certainly worth a glance, but make sure to save some optical energy for the official official bike shows, as well! The bikes on display aren’t the showroom models you’d find on the floor of a dealership; these are custom bobbers, choppers, and other functional masterpieces. We also recommend speaking with some of the bike builders who hang out by their one-of-a-kind creations. Hearing someone describe the hard work and imagination that went into a hand-crafted creation can be an inspiring experience. And if the bike owner lets you sit on the bike and snap a photo to share on Facebook or Instagram, even better! Riding a motorcycle is like the ultimate demonstration of freedom. While you’re at Leesburg Bikefest, take a few minutes to visit the Veteran’s Memorial At Fountain, one of the largest veterans’ memorials in the southeast, to honor the active-duty servicemembers and veterans who support our freedoms. Our attorneys with 911 Biker Law help clients exercise their rights under the law every day. That’s why we’re unwavering supporters of the men and women in uniform, from law enforcement to the armed forces, who help afford all of us our rights. 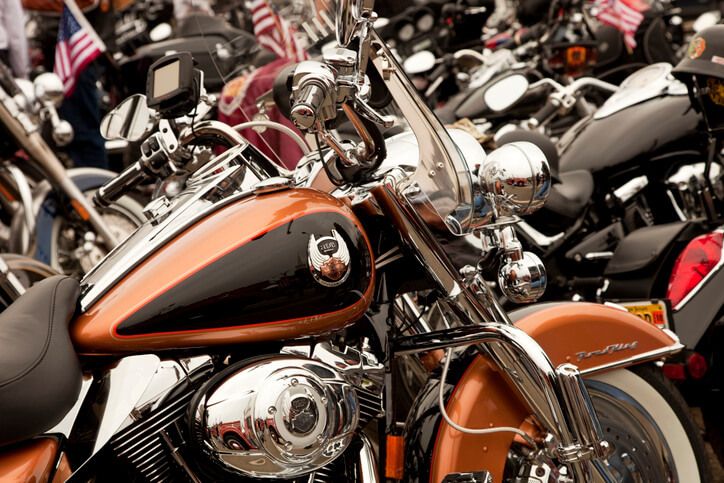 Stay connected with 911 Biker Law on our website and on social media to receive updates about Leesburg Bikefest 2019! And don’t forget to ask us about our Free Tow Cards, which, after motorcycle accidents or mechanical issues, provide free roadside assistance!